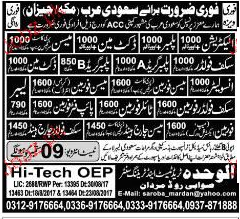 Electricians, Plumbers, Ductman, Tiles Foreman, Scafolder Forman and Mason Charge Hand are required in Saudi Arabia. Food, Medical and Residence will be provided by the Company. You can apply online at vacancy after registering at http://www.jobz.pk site.